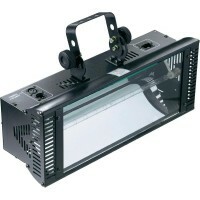 Revolutionary 5-Zone LED Chasing Strobe 2-FX-IN-1: Traditional LED Strobe + 5-Zone chase ..
Power: 1500 WAdjustable flash frequencyDimmable (only from the device itself)Dimensions: 453 x 132 x.. Wired remote for extra 5 EUR.. Consists of:1 x Martin Atomic1 x Martin Atomic Colors..